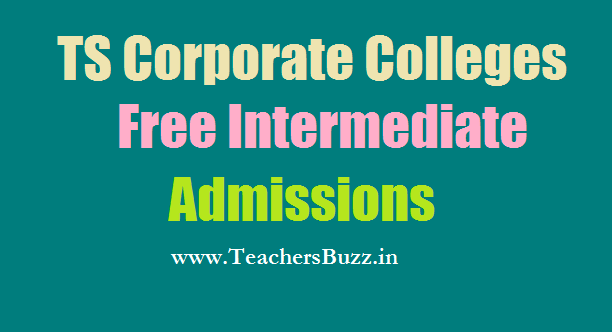 Telangana State Government has given the Corporate Colleges Inter Admission notification 2019 schedule and applications are invited from the SC, ST, BC, EBC, disabled and Minority Students 7.0 GPA SSC 2019 Passed Candidates for admission into Inter courses in Corporate Colleges for the academic year 2019-2019. So, interested AP SSC Students can apply through online mode apepass.cgg.gov.in Web Portal and interested TS Students can apply online on telanganaepass.cgg.gov.in Web Portal. Social Welfare Department has issued admission notification 2019 through press media for admission into corporate colleges. The Social Welfare Department invites online applications from the eligible candidates for admission into Corporate Colleges for this academic year 2019-2020 in both states of Telangana and Andhra Pradesh. 1. The students belongs to SC, ST, BC,EBC, disabled and minority students are eligible to admission into corporate colleges. 2. Annual income of parents belonging to SC and ST students should not exceed Rs. 2 lakh and Rs. 1 lakh in the case of the parents belonging to BC, EBC and minority students. 3. Students, who have passed Tenth Class in March 2019 and scored 7.0 GPA and above are eligible to apply for this notification. 4. Students of Government Social Welfare hostels, Ashram Schools, Kasturba Schools and Day-Scholars of Muncipal, Zilla Parishad and Aided Schools are eligible. 5. The students of government residential school and Javahar Navodaya Vidyalaya are also eligible to apply. Interested Telangana Students can apply from through online mode at telanganaepass.cgg.gov.in web portal, https://telanganaepass.cgg.gov.in/CorporateApplicationForm.do . Interested Telangana students can apply through online mode at telanganaepass.cgg.gov.in web portal. Interested AP students can also apply through online mode at https://apepass.cgg.gov.in/ as per schedule. 2. Bonafide certificate issued by the Head Master of the school from which the candidate appeared for Class X exam. Interested TS students can apply from ....-05-2019 to ...-06-2019 through online mode at https://telanganaepass.cgg.gov.in/ web portal. Interested AP students can also apply through online mode at https://apepass.cgg.gov.in/ as per schedule. 8. Click on the Get Details and download your seat allotment order and preserve the future reference(for attending the certificates verification).